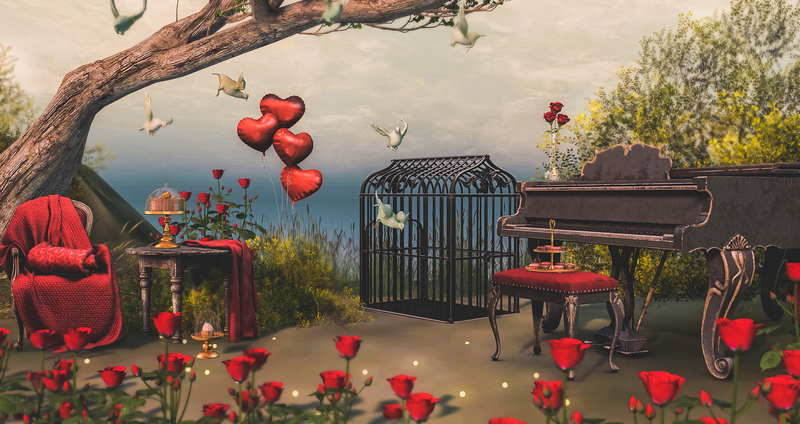 Valentine’s Day passes me by a little in Second Life as it’s also the day of One Billion Rising in Second Life. This year I am dj’g for the opening at midnight slt and then again for the closing at 11pm slt as well as being around to attend events and support the efforts of the OBR team. That said, I do like a touch of romance on the day too. Artem and I just have to plan around it a little. We’ve already taken a photo to commemorate our second Valentine’s Day together. It’s actually the third Valentine’s Day in a way…between you and I and don’t tell him but three years ago I had a huge crush on him. He was totally my “Flickr Crush” but it was another six months before I won him over. I still have a huge crush on him and he’s for sure still my “Flickr Crush” but now he’s officially my Valentine instead of someone I crush on from afar. I still consider myself incredibly lucky to have found him too. Ok gonna shut up before I get too mushy. Hope you like the scene for the photo, all the details are below! Have a great Tuesday and Happy early Valentine’s!